"I am so glad to have found programs for my adult students. MathMedia programs do not talk down to students. This is so important for adult students." •	Do you wish you had the skills it takes to get to the next level at your job? •	Are you looking for a new career field? •	Are you interested in some enrichment courses or in need of adult basic literacy education to keep you knowledgeable or prepare you for today’s workforce? 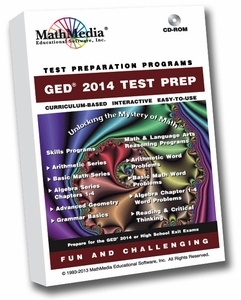 Prepare for and master the GED® 2014 Test Prep on CD or via the web and walk in prepared - from having practiced these all the required concepts which are explained and practiced in detail. The GED test has traditionally been an opportunity for those for whom a high school diploma was not feasible for whatever reason. 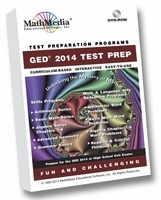 Passing the GED® 2014 Test provides opportunities. GED® testing can be intimidating, but being prepared, is the key to confidence. Math seems to be a stumbling block for many. For this reason, we have provided comprehensive math practice problems and practice tests. 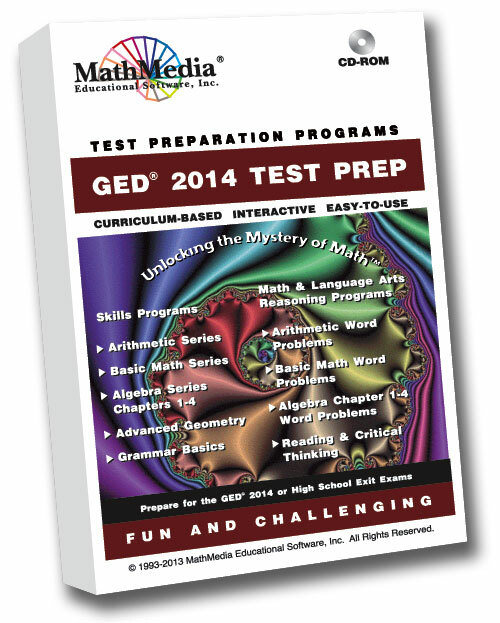 This GED® 2014 Test Prep Bundle offers extensive practice with step-by-step hints and solutions. If you study each solution, you will leave each question knowing how to do the problem. Since the new GED® 2014 Test is more extensive with higher expectations, we have assembled this 23-program bundle to meet the needs. Also included in this bundle is Reading Comprehension practice which is necessary for the Language Arts portions of the new GED® 2014 Test. The Reading and Thinking – Level 3 includes over 100 reading passages in Social Science and Basic Science principles. Many quotes from satisfied customers are located at http://mathmedia.com/whatdousthin.html . If you need help fitting into your budget, we will work with you. GED® is a registered trademark of the American Council on Education (ACE) and the GED® brand is administered by GED Testing Service LLC under license from ACE. Used with permission.